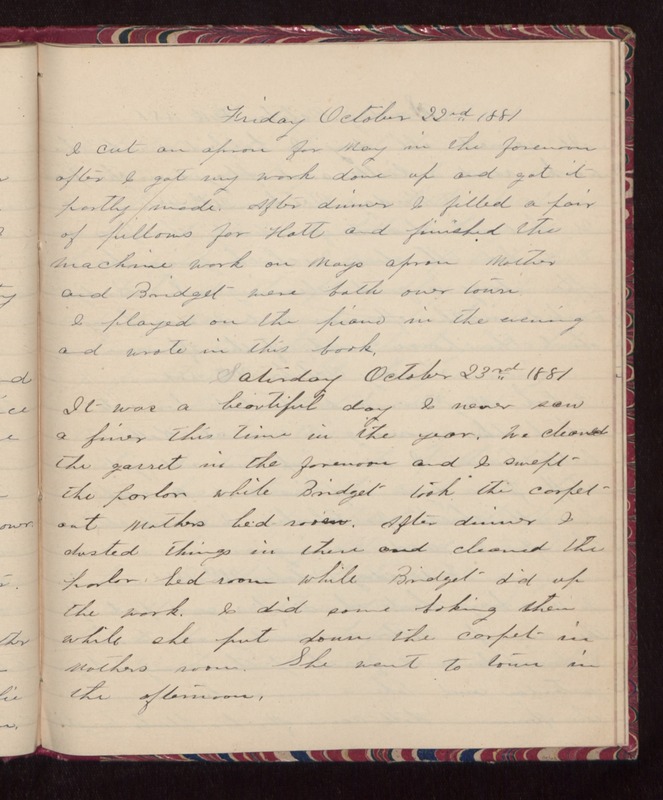 Friday October 22nd 1881 I cut an apron for May in the forenoon after I got my work done up and got it partly made. After dinner I filled a pair of pillows for Hatt and finished the machine work on Mays apron. Mother and Bridget were both over town. I played on the piano in the evening and wrote in this book. Saturday October 23rd 1881 It was a beautiful day. I never saw a finer this time in the year. We cleaned the garret in the forenoon and I swept the parlor while Bridget took the carpet out Mothers bed-room. After dinner I dusted things in there and cleaned the parlor bed-room while Bridget did up the work. I did some baking then while she put down the carpet in Mothers room. She went to town in the afternoon.